It’s certainly been an odd year. Straight from winter to high summer and now it’s like autumn if not winter. Judging by the berries on the trees, when winter does arrive it’s going to be a long cold one. Jumbo Peppers – they’re sitting on a dinner plate! 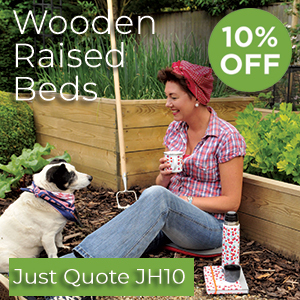 My sowing and planting plans went completely to pot at the start with the late cold weather. The peppers were kept in pots far longer than planned before being planted out into the border soil of the polytunnel. I did tease the roots out before planting but some of the plants have stayed small as the roots failed to spread. On the plus side, although there have been fewer fruits than I normally expect, the fruits we’ve had are superb. 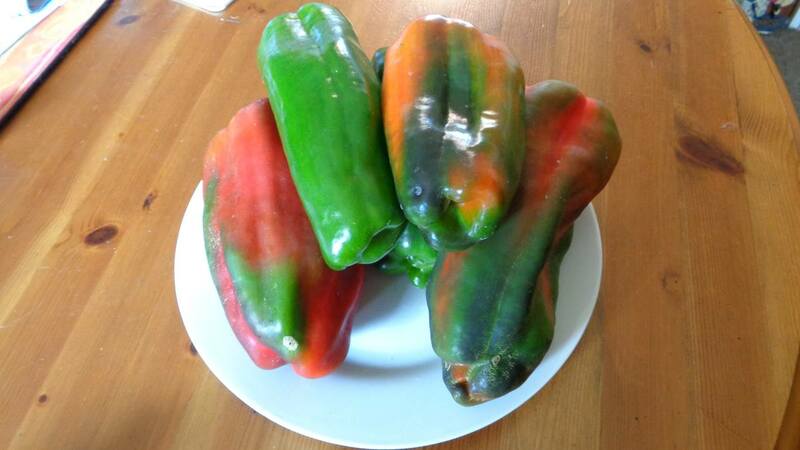 I’ve grown the pepper variety Jumbo in the past but this year’s fruits are super-jumbo! The plan was to plant out the potatoes on or around St. Patrick’s day. Down came the snows and they finally went in the ground in early May! I’d already had a crop of first earlies (Arran Pilot and Homeguard) from the the polytunnel, but I’d a few left over along with some Charlotte. 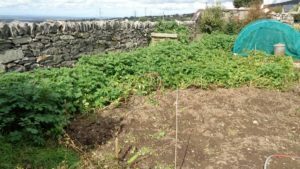 Potato Plot – Half harvested. 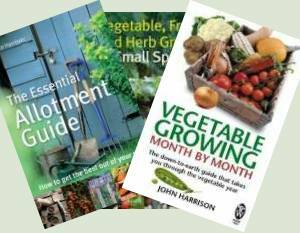 leaving the maincrops to grow on. With the first earlies I tried a new method. The ground had been well manured the year before and seems in good heart, so I just dug holes with a trowel and dropped them in. 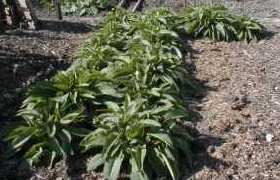 The rest of the plot was rotavated, which fluffed up the soil and loosened it, before planting out. Well the yield from those first earlies and Charlotte was pathetic. That’s one experiment I won’t bother repeating. 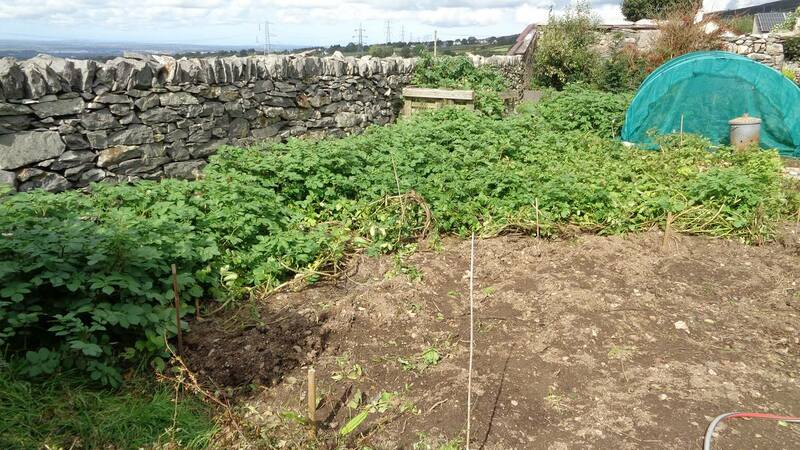 The rest of the potato patch have put a lot of top on. They’re looking great but I’m worried about the dreaded blight hitting. The conditions have been right for some time. The varieties are all supposed to be blight resistant but blight resistance varies depending on the strain of blight. The row of Orla came up trumps, most of the tubers are a good size and yield was great. We’re really pleased with Orla; they hold together well when boiled, chip and roast well too. We’ll see how they mash soon. Sadly the Sarpo Kifli have not done well. After digging up half of them, decided to leave the second half for another couple of weeks to see if the yield and tuber size improves. I’ve still got Mira and Blue Danube in the ground and don’t intend to harvest the Blue Danube until mid-September and the Mira maybe as late as mid-October. It’s been the year of the butterfly. The number of cabbage whites flying around has been ridiculous. I’d planted some pak choi which had started to bolt but that didn’t really matter as days later they were munched to skeletons by caterpillars. Inside the Brassica Cage it’s like a cabbage jungle! 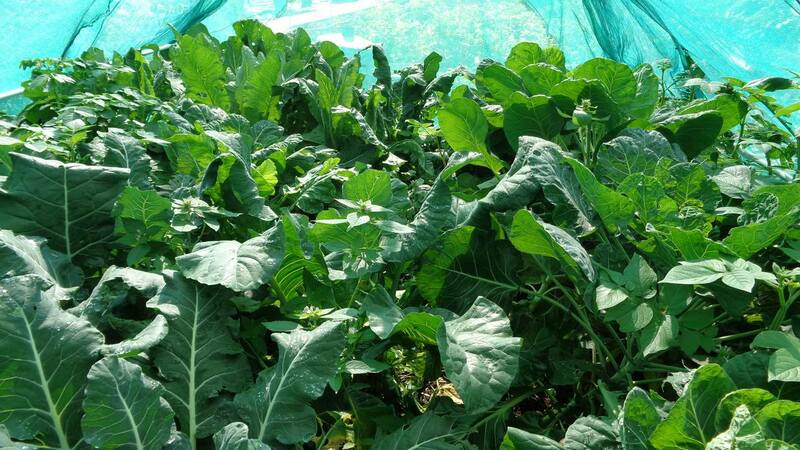 Happily the butterflies haven’t found their way through the netting into the brassica tunnel. I’m convinced that, without the tunnel, despite all I could do, I’d have lost the lot to the caterpillars. I’ve had the first flush crop of calabrese now, and very nice too. More than we can eat fresh – although it will keep well wrapped in cling film in the fridge – so a blanch and freeze session. It’s better fresh but perfectly acceptable frozen. The main heads were just cut from the stem leaving the secondary heads to grow. Usually with calabrese the yield from the secondary heads is as good as the primary head, so looking forward to more. It’s always a bit tricky judging when to harvest calabrese.Too early and you miss out on yield but too slow and it bolts and flowers. Watch out for the first sign of yellowing and harvest immediately before it bolts and toughens. For my brassicas I invested in some veggie mesh which was supported on a frame. All was well until I was looking at the Brussels and I noticed signs of caterpillar damage plus some small cabbage white butterflies in the frame. The butterflies could not have got in, so my reasoning is the caterpillars had pupated out of the ground from previous year and the butterflies had then mated and laid the eggs and hence my poor old Brussels eaten. Any thoughts on this problem. I reckon it’s more likely one found a little gap an sneaked in but the real lesson is to check even if they’re in a cage. John, one possibly, but half a dozen no way. Question where do the caterpillars of the cabbage whites go to on maturity. They don’t spin a cocoon like some caterpillars so the only other place is into the ground. I try to move the brassicas around each year but inevitably there is an overlap on previous years and so I am still of the opinion that they have emerged and reproduced under my veggie mesh. After wandering for some time, the larva finds a suitable pupation site that is typically away from the foodplant, such as fences, tree trunks, and under any overhang on a building, such as its eaves. The pupa is attached by a silk girdle and the cremaster. This stage lasts around 2 weeks for pupae that produce the summer brood. This stage lasts around 8 months for pupae which overwinter and that produce the spring brood.